West Windsor, N.J. – Eleven Mercer County Community College (MCCC) students are proud new members of the Kappa Iota chapter of Alpha Mu Gamma, the national collegiate foreign language honor society. According to chapter advisor Stephen Richman, an MCCC professor of Spanish, the organization was established in 1931 and has grown to include 349 chapters nationwide. This year MCCC's chapter celebrates its 30th anniversary. Since its founding in 1984, 433 students who have excelled in their language studies have been inducted. This year's inductees include Jana Brega (Spanish), Stephanie Cremer (Japanese and Chinese), Victoria Jimenez (Spanish), Tiffany Jones (Spanish), Stefanie Livecchi (Latin), Theresa McNichol (Chinese), Hayley O'Rourke (Spanish), Donyah Saleh (Arabic), Sonia Santiago (Spanish), Tristan Shmittinger (Spanish), and Sylena Tanner (American Sign Language). 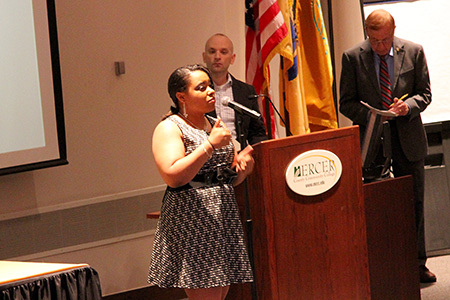 In keeping with MCCC's induction tradition, each student delivered a short speech in the language she is studying. Stefanie Livecchi noted during her speech that her love for history is the reason that she has been drawn to Latin studies. Tristan Shmittinger, who has excelled in Spanish, will transfer to Rider University in the fall, and plans to be a Spanish teacher. 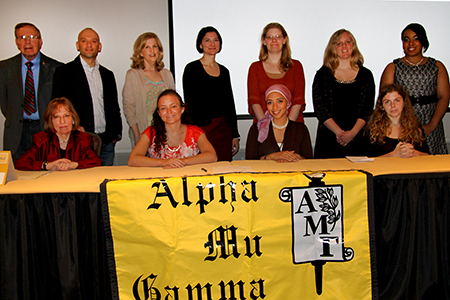 Requirements for induction into Alpha Mu Gamma include a grade of at least an "A-" in any two courses of the same language and an overall GPA of at least a 3.2. The ceremony was presided over by chapter President Nancy Baskin and Vice President Ariela Weinberg, along with advisors Steve Richman and Daniel D'Arpa, associate professor of Spanish. Mercer offers courses in Arabic, American Sign Language, Chinese, French, German, Italian, Japanese, Latin, and Spanish. Inductees and their mentors, front row from left, Chapter President Nancy Baskin, inductees Haley O'Rourke, and Donyah Saleh, and Chapter Vice President Ariela Weinberg; back row from left, Professors Stephen Richman and Daniel D'Arpa, and inductees Theresa McNichol, Stefanie Livecchi, Stephanie Cremer, Tristan Shmittinger and Sylena Tanner. 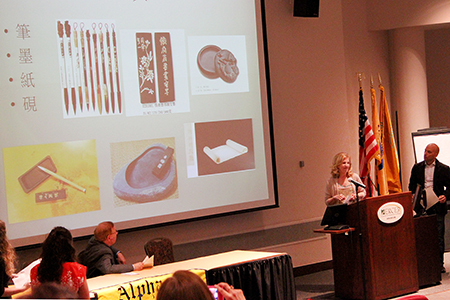 Terry McNichol spoke in Chinese about the Four Treasures of the Chinese Scholar: Brush, Ink, Paper and Ink Stone. An MCCC art instructor, McNichol includes this slide in Art 124, a course she teaches on non-Western history that covers India, China, Japan and the Pre-Columbian world. Sylena Tanner presented her comments in American Sign Language; the text of her presentation was shown on the screen behind her.